Do you want to get well? This is such an odd question to ask someone. Typically most people want to feel well and to get better if they have something that ails them. Yet Jesus asks this very question in John chapter 5. There we find the story of the man sitting by the pool of Bethesda. He has been there for 38 years waiting for an angel to store the waters so that he can be the first one in and be healed. Jesus finds him there and ask him, do you want to get well? 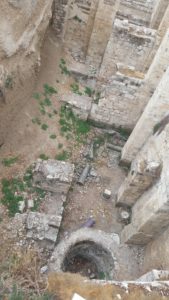 Here is the actual site of the pool in Jerusalem. We know this because of water and the fact that this is the specific site where the water has been and comes up. Why did Jesus ask this question? It seems so odd, yet so many people we know have problems, difficulties, frustrations, and sin in their life, don’t really want to get well. They simply want a way to be able to enjoy their sin. For us to be made well, it means we must leave the things that are against God. We must be obedient to him. Are we willing to leave behind the things in our life that are in Rebellion to God? If we want to be made well, we can only be made well by following him.